Toshiba's Digital Products Division (DPD) announced an affordable addition to its line of universal docking stations, namely the dynadock V3.0. Toshiba's Digital Products Division (DPD) (a division of Toshiba America Information Systems, Inc.) announced earlier today the addition of a new product to its family of universal docking stations, the affordable dynadock V3.0. 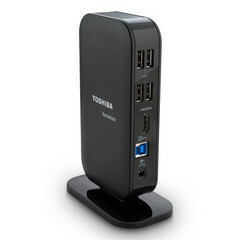 The Toshiba dynadock V3.0 allows any Windows-based laptop to be connected to an external monitor and a few additional devices at once, being fully compatible even with full-size keyboards or printers and optical drives. Unfortunately, it does not feature an Ethernet port. Compared to its predecessor, the more expensive dynadock U3.0, the new universal docking station from Toshiba promises to provide faster speeds and improved graphics quality, thanks to the addition of USB 3.0 ports and HDMI out support. The dynadock V3.0 features no less than six USB ports (two front USB 3.0 ports and four rear USB 2.0 ones), while its HDMI out supports both full HD video and 5.1 channel audio. On the other hand, the internal video card of this universal docking station supports resolutions up to 2048 x 1152. Already available from major retailers and e-tailers, the dynadock V3.0 can also be purchased from ToshibaDirect. Here, you can get it for $104.99, but only until the 5th of August, when its price will bounce back to $119.99.